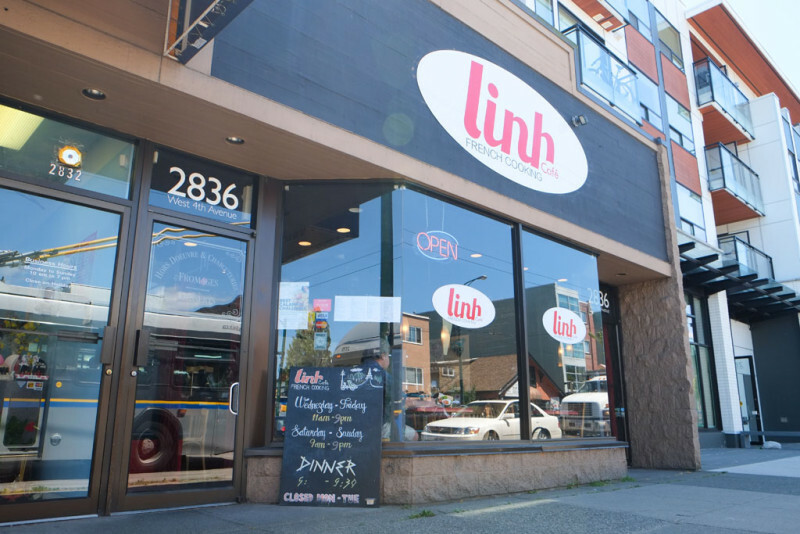 Linh Cafe on Broadway near Macdonald. 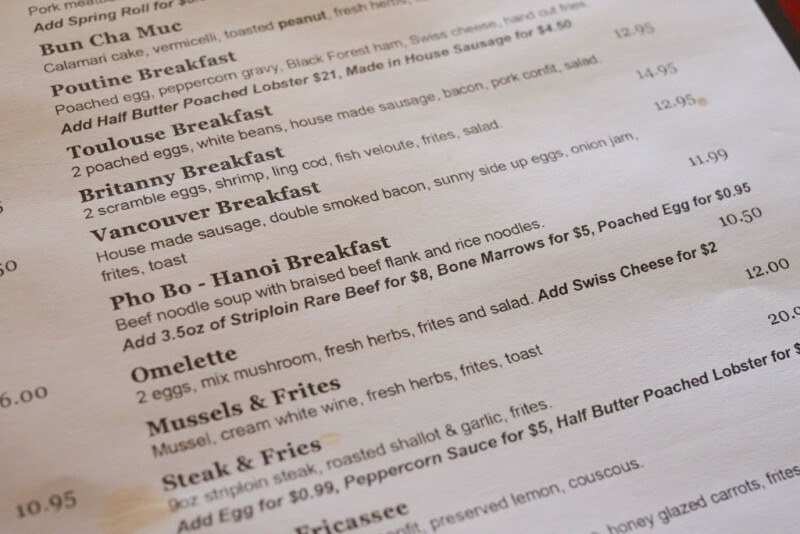 I chose the Pho Bo and added bone marrow yes yes please yes for $5. Prices are definitely westside as opposed for eastside as far as the Vietnamese dishes go, but if it tastes good and is executed well, I don’t mind. 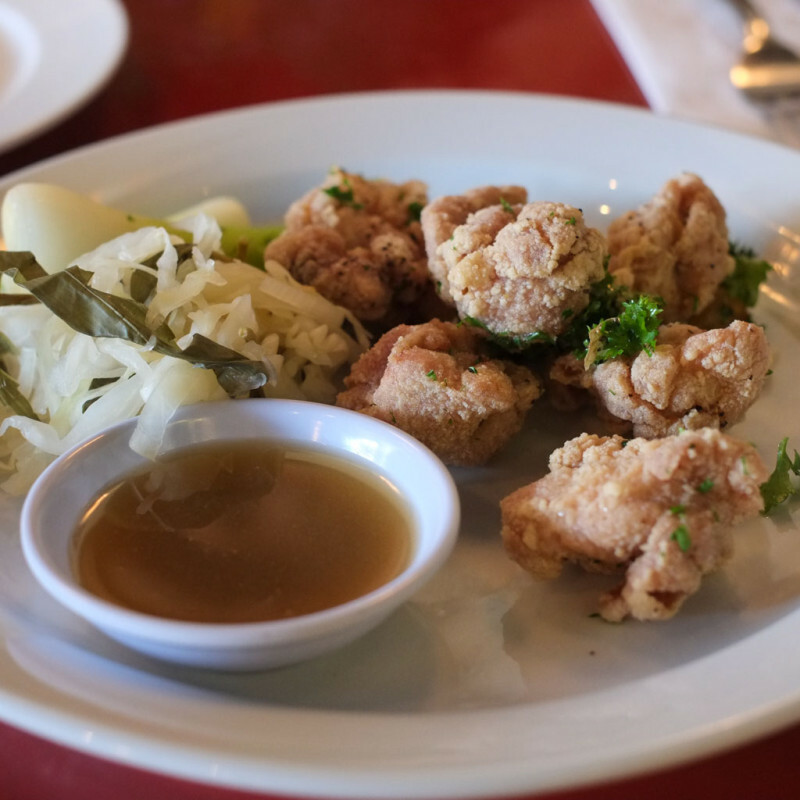 Crispy Sweetbreads ($10.95) served with an intriguing sauerkraut that contained rau ram (aka laksa leaf)! The dipping sauce was a salty/sour/tangy/peppery concoction that contained salted lemon(!). 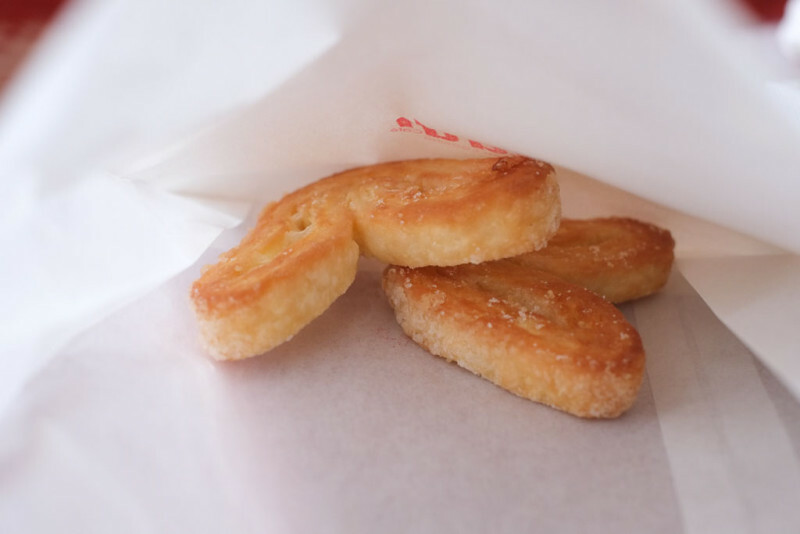 It’s a taste that Wicca recognized from her childhood in Vietnam. 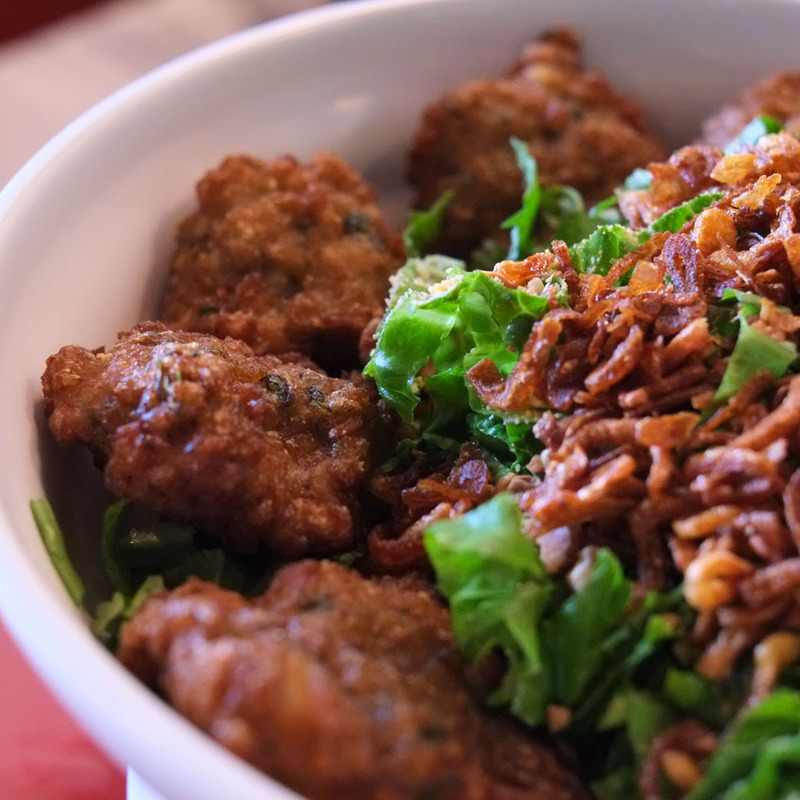 A very sly Vietnamese element slipped into this dish. Great stuff. Veal sweetbreads. Glandular goodness. 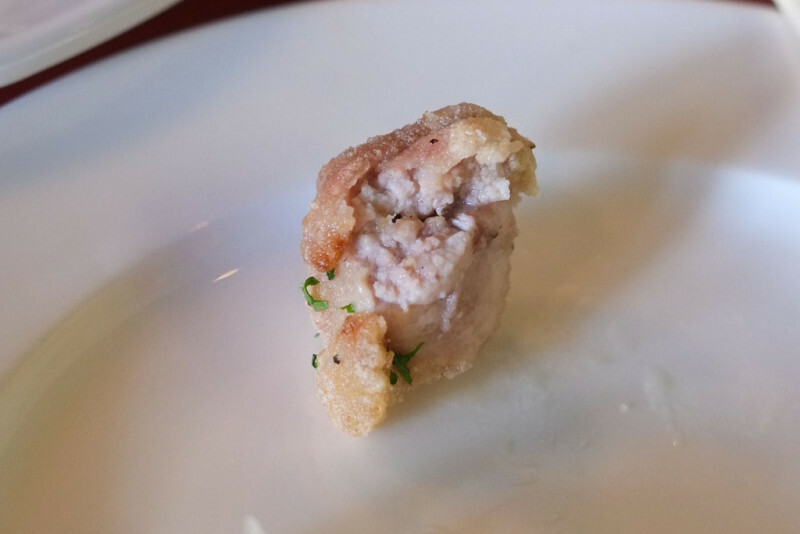 Of course Serious Eats has some good reading on sweetbreads. 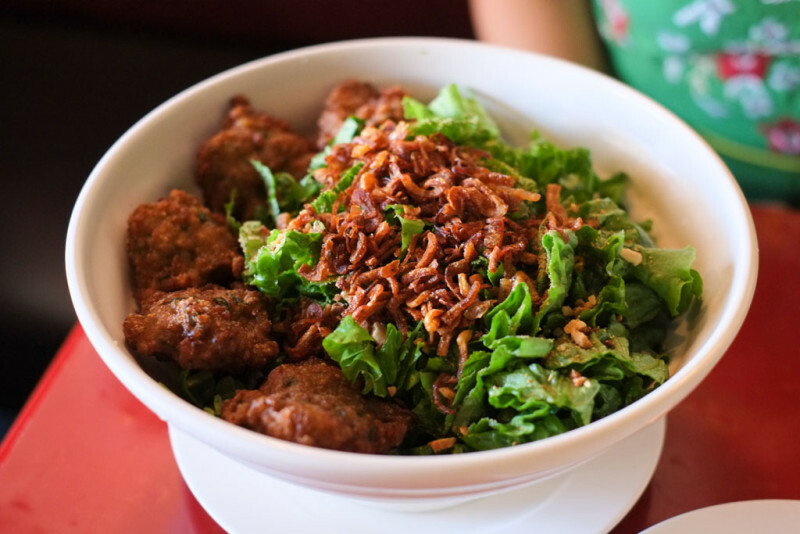 Bun Cha Muc ($9.50) – vermicelli noodle bowl with calamari cake, lettuce, herbs, fried shallots and roasted peanuts. The brothy fish sauce mixture is already in the bowl, so you just mix it up and eat. 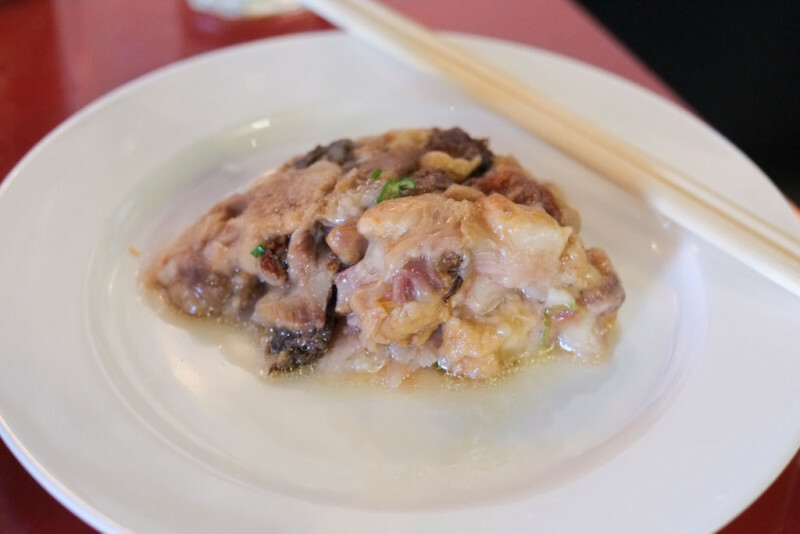 This is different than how bun cha is usually served (like at Mr. Red Cafe, Broken Rice, and others), where the elements are separated, and the meat is served in a bowl of fish sauce and you “build-a-bite” as you go along. Eating it this way is much more convenient though! 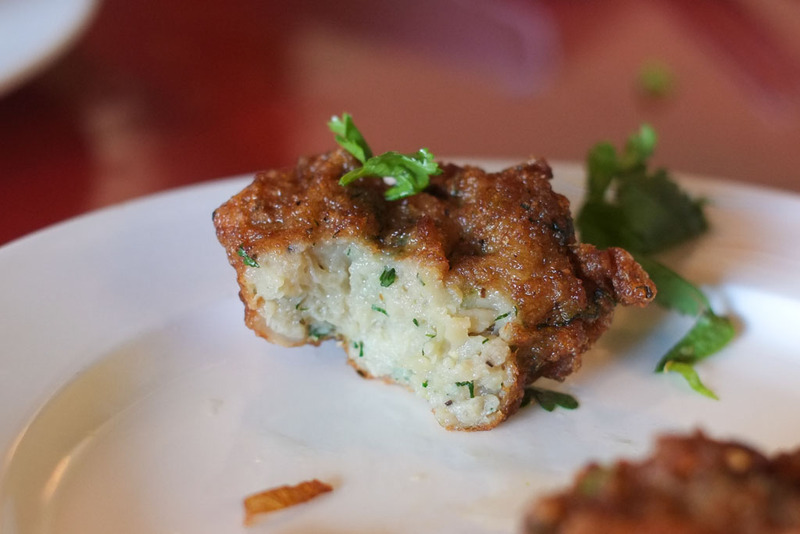 We loved the texture of the calamari cakes — bouncy and springy mouthfeel with just the right amount of seasoning, plus a bit of a chunky texture. I liked the fry on the outside too. Cross section of the calamari cakes. 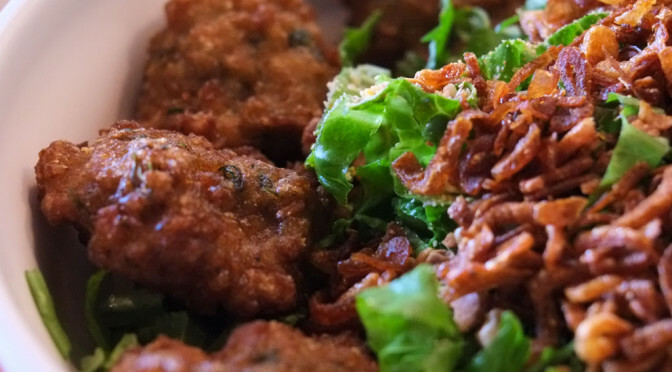 They’re like fish cakes or fish balls except using calamari. 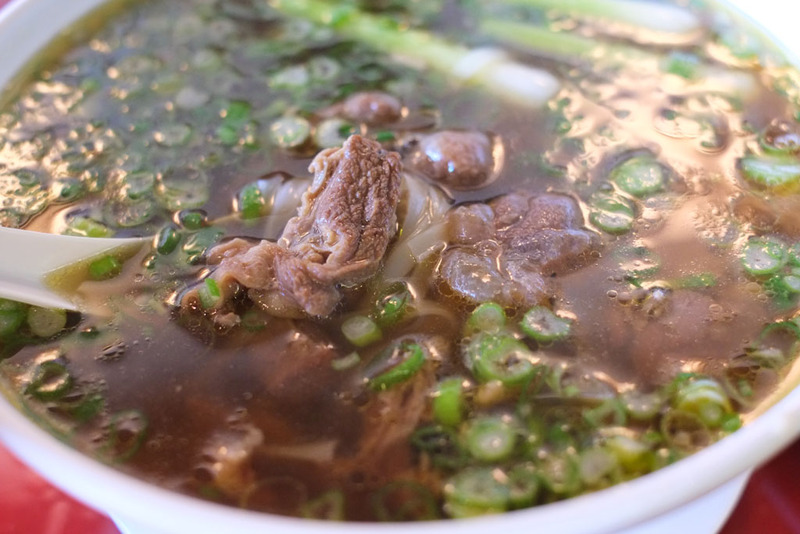 Pho Bo – Hanoi Breakfast ($11.99) – pho with braised beef flank. That lump of fatty white stuff is the bone marrow which I added for $5 more. The meat and noodles. Good cook on the noodles. I like how it wasn’t like a big clump of noodles that’s hard to separate. 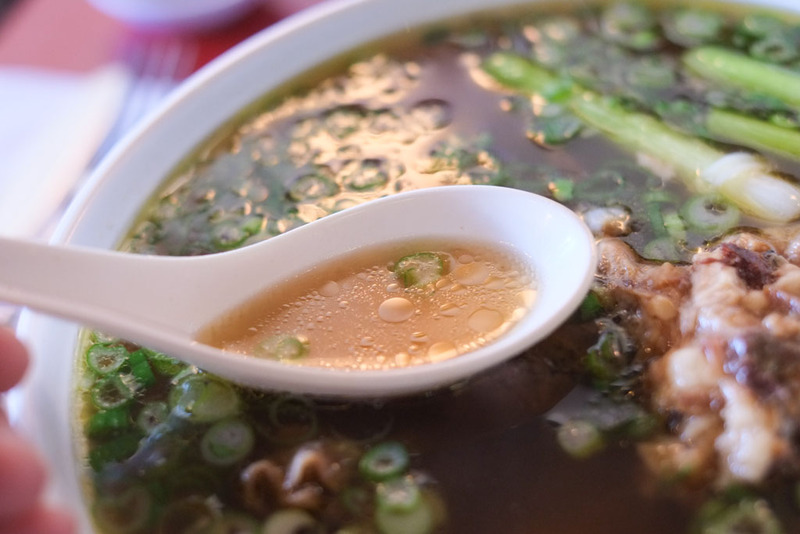 The broth had perhaps a bit too much MSG than I’d prefer, but the flavour and clarity was good. 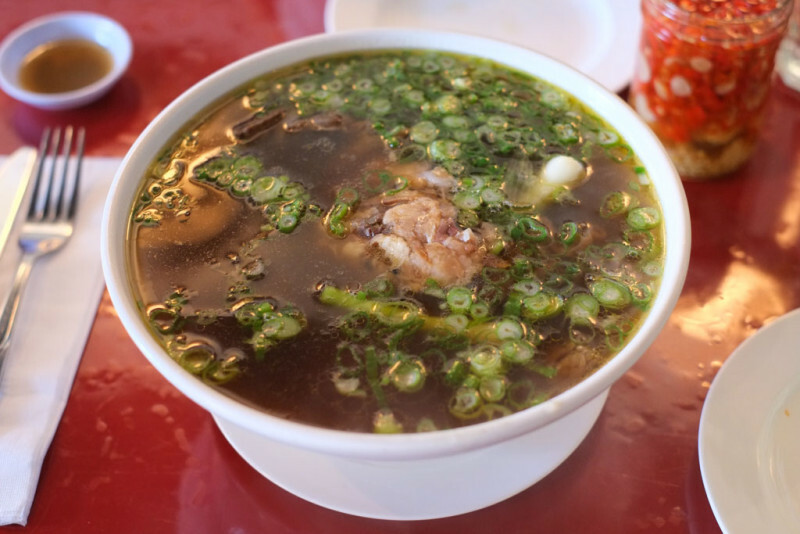 This is one of the very few times I’ve had Hanoi or Northern style pho, and it seems to be less spice-heavy than the more typical Southern style pho. Main aromatic that I could detect was star anise. Otherwise a very good beef flavour. We were given these complimentary palmiers. In fact, we saw the staff giving a few tables complimentary pastries. These would be Wicca’s last choice in a pâtissier, but she liked the butteriness and freshness. I believe they do all their baking as well. 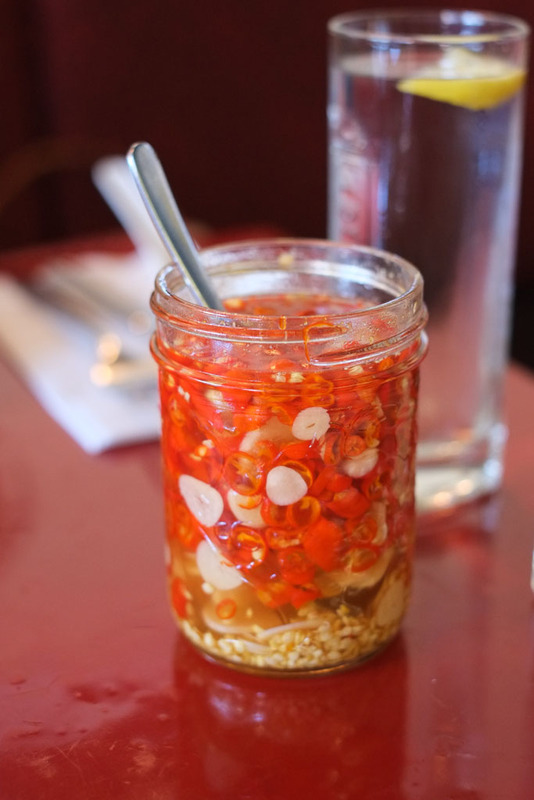 Linh Cafe is a very solid westside Vietnamese option. 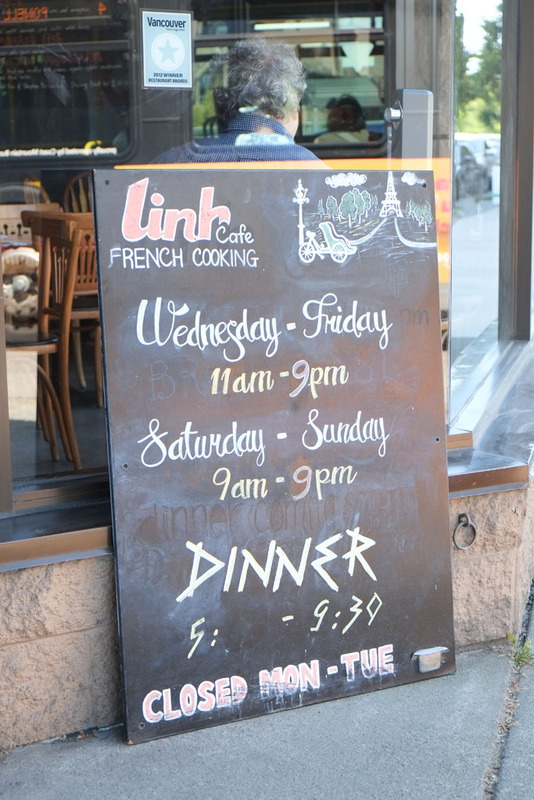 I hope to try the French side of the menu next time! Great report as usual! 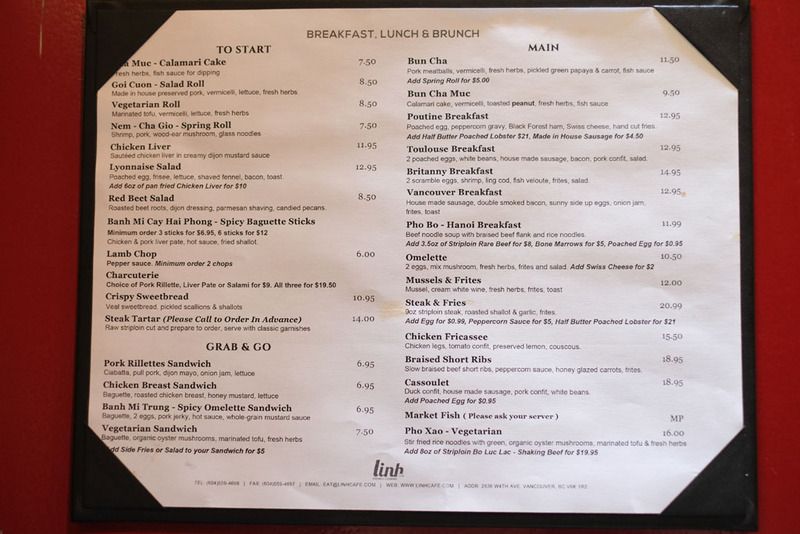 We go to Linh’s for breaky occasionally as it is so close but haven’t ordered any of the Vietnamese options yet. Must rectify that soon. I got croissants to go last time that were just okay. Will have to try the palmier.